I know, right? That spiral shape is fascinating. 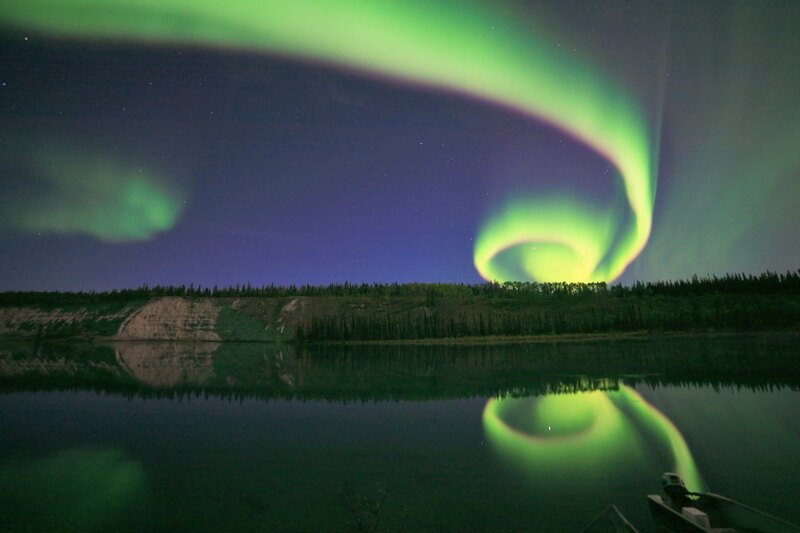 Aurorae are formed when charged particles from the Sun slam into the Earth’s magnetic field and interact with it. They’re channeled down into our atmosphere, guided by the Earth’s field, and the shape of the aurora reflects the underlying magnetic field lines. They take on fantastic shapes, including spirals like this, but I don’t think I’ve ever seen curled in a way so well-defined and crisp. If you look carefully at the bigger version, you’ll see some familiar stars like those forming the constellation Auriga in the center, while the Pleiades are visible nestled in the spot right where the aurora starts to wind up. The bright "star" which is also reflected in the water is actually Jupiter. I had a hard time distinguishing it from the bright star Aldebaran in Taurus, but I think that’s lost in the brightest part of the spiral (though you can see it better in the water to the right of the stretched-out Jupiter reflection). David lives in the Yukon Territory, not far from the southeast corner of Alaska, and I imagine aurorae are a fact of life there. He has quite a few devastating shots of the northern lights in his Flickr stream. Treat yourself and take a look. His shots of atmospheric phenomena are also incredible. – Up, up, and aurora!